A great reason not to be grumpy! Paul Steinson, a music-lover and record-collector in England, read the article about downloads of historical recordings in Classic Record Collector (No.61, Summer 2010, pp.46-49) and noticed that the British Library's Archival Sound Recordings website has some of Anthony Bernard's legendary 'lost' cycle of Bach's 'Brandenburg' Concertos - but not No.2. This recording has previously been reissued but only in a set of cassettes which accompanied Ewald Junge's biography of the conductor, Anthony Bernard - A Life in Music, published as a limited edition in 1992. 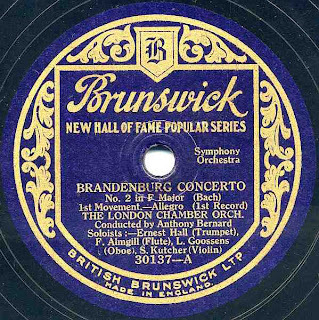 This first-ever complete cycle of the Brandenburgs, recorded I should think some time in late 1928 and early 1929 (does anyone have more precise dates and/or a location? )*, was slated for release on twelve records, 30135-46, in March 1929. That month The Gramophone published a fascinating article by Bernard himself, recounting the difficulties posed by the recordings and revealing that the sessions, which he called a 'costly enterprise', had been completed only days before the time of writing. 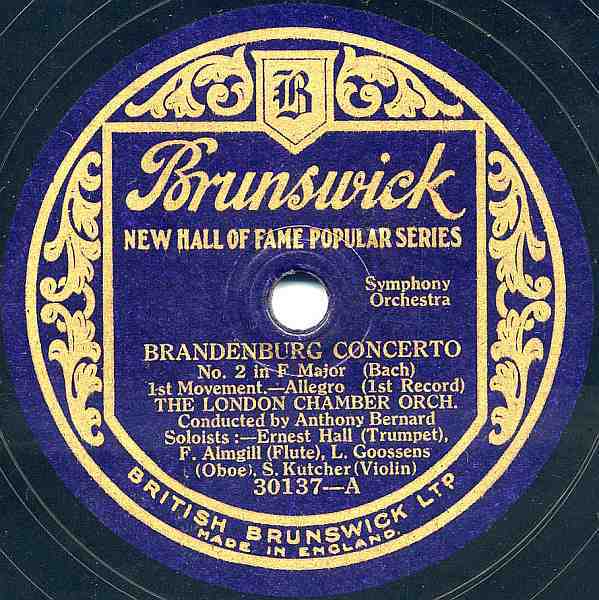 As he admitted, 'The Second Brandenburg Concerto with the very high trumpet part could not be given exactly as written by Bach; both microphone and wax would have rebelled.' Perhaps the second side, which was published from take 11(! ), was one of the last to be redone? For a while, I thought Bernard had deployed a harp on continuo in the slow movement; but it must be a harpsichord stop, chosen by Rudolph Dolmetsch on the instrument, presumably from the family workshops, which he played in this Concerto as well as in Nos.3, 4 & 6 (and a Pleyel in No.1). But the same month, the entire cycle was suddenly cancelled and almost completely destroyed; some copies must have got out, as there are survivors, seriously rare (no full set is known, I gather). The sad story has been told in detail by David Patmore in Classic Record Collector's 'Rarissima' column (No.44, Spring 2006, p.9). Dr. Patmore countered Junge's suggestion that the cycle was withdrawn because 'Bach was too risky commercially' with the more plausible explanation that, in 1929, Decca, which had just taken over Brunswick, was in dire straits and had to retrench and regroup drastically. With extraordinary generosity, Mr. Steinson has transferred his own complete set of No.2, scanned the label of the first side (above), and agreed to allow the transfer to be further processed, if need be, and shared here by Grumpy. The entrance to the cave has been duly spruced up and all coprolites and mouse skellingtons swept to the back. The indefatigable and highly knowledgeable Jolyon has tweaked the difficult side-join in the first movement and sprinkled his fairy-dust on Brunswick's sound, which he calls 'nasty' and 'harsh' and which made him wonder if this was one of the company's 'Light-Ray Process' efforts: 'The original recording has been made in a rather boxy room. The last movement is transposed a semitone up but the trumpet plays an octave down anyway so I left the pitch alone. I have pushed all the instruments back a bit so they are not so in your face. I can't get rid of all the edginess but I hope it is a bit clearer.' I think it is an improvement but mainly I'm thrilled to be able to hear this at all! Download Jolyon's version of Mr. Steinson's transfer as one fully-tagged, mono FLAC file, from here. Can anyone explain the matrix numbers starting BA? Bernard's Brandenburgs begin at BA71, yet Ross Laird's great Brunswick book shows no such matrices originating in London, only in Buenos Aires! Any matrix numbers for the rest of the cycle gratefully received. And scour your attics: the keyboard part in Concerto No.5 was played on the piano by Walter Gieseking, no less - wouldn't it be grand to hear a complete set of that! My eternal thanks to both Mr. Steinson and Jolyon - exactly the kind of generous, altruistic collectors (like so many of the bloggers over on the right-hand side of this page) who will be the subject of the next article about downloads of historical recordings, in the forthcoming (Autumn) issue of CRC. *Postscript: Jolyon, who has a usefully forensic approach to discography, reckons from the matrix numbers that this Concerto may have been recorded between the 10th & 18th of October 1928. Nothing to do with Buenos Aires, he assures me; these BA-prefixed numbers were a London series not recorded in the documents available to Laird (and indeed none of Bernard's sessions have numbers in Laird's book). And it turns out the BL does in fact have a copy of this set. It should have been included in the Archival Sound Recordings Bach survey but for some reason was omitted; I understand this may be rectified! At the moment the BL is busy hoovering up some rare and interesting early Beethoven quartet recordings which were also overlooked and should be posted on ASR fairly soon. Well, now - this is a rare one! Most fascinating story as well - I remember reading about in CRC. Yes, Quite a story Nick. Thanks for sharing! The story behind that "BA" will be fascinating I am sure. Many thanks for this rarity! One thing: I have the book about Anthony Bernard (it came without the cassettes, unfortunately), but do you know who Ewald Junge actually is? My searches come up quite blank. He may still be alive. One other thing: an LP released for the W. Gillies Whittaker Centenary by Viking Records featured his choral music (including the famous Psalm 139) sung by the Halle Choir under Maurice Handford. If you ever manage to get your hands on a copy, you'll be a lucky man indeed! I've been trying for years and the LP isn't even 'old' by most standards. No, I don't have that Whittaker LP - sorry! Thanks for finding the relevant page. I have the Purcell Indian Queen but some of the Record Society releases (not the CFD issues but recordings made expressly for the RS) are also on the list of rarities and most of them were conducted by A. Bernard. It's amazing what you find on the internet if you keep looking and try different ways. A search for Samuel Kutcher in "Google images" brought up the Brunswick record label above!! I am putting together a biography of Samuel Kutcher (Kutcher String Quartet 1923 - )and this will be a valuable addition. Many thanks. Please do contact me if you want any further information on this project. Yes, I am quite interested in Kutcher, actually - I searched for him briefly and found a fascinating page about his WWI army service - was that your doing? I'd love to know more. Thanks! Right .. the WW1 material was stuff I put up on the Kutcher family website some time ago. Let me know where I can email you a pdf of what I have researched up to this point. I have only got as far as 1925 but also have some copies of his recordings from that year. Oh, fantastic! What recordings do you have? Of course, I would love to hear them and to see whatever documentation you have collected. errrmmm .... how do I get them to you? I can't find an email address anywhere ! !